On Tokyo, alienation, and its value. 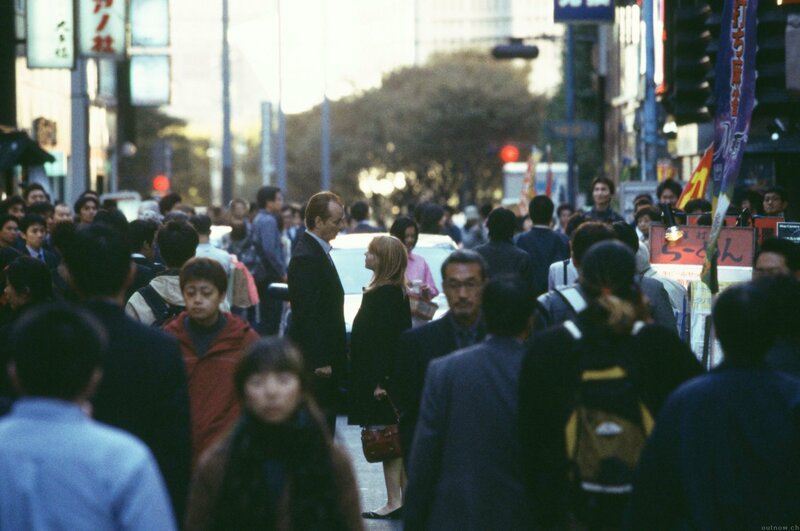 Like many others, I visit Tokyo with Lost in Translation in mind. In the movie, we see a weary Bill Murray and a young Scarlett Johanson meet as Western strangers in Tokyo, two lives cracking under both personal and cultural alienation. They don’t know what to do with their lives, are failing to communicate with their partners, and they cannot parse the neon-lit surroundings of Shinjuku in which they find themselves. At the end of the movie, they leave their audience equally estranged, as the famous final scene leaves us equally removed from any neat sense of closure. To me, the two characters epitomize a particular kind of loneliness. Murray plays a successful but washed-up actor not unlike himself at the time, Scarlett is a young philosophy major from an Ivy League university with no clue of how to brand herself or to become a member of society. Both of them are experts though, demonstrating that the more we try to latch onto this life, the more we are confronted with its fluidity. We get really good at understanding something, at a craft or a skill, a style or theory, and with every step, we realize more how incommensurably different our own attempts are compared to those around us. There is a rift, the existential kind, that won’t be bridged by our increasing capacities. We’re not born snowflakes, but we become them through our own professional strides. Dean MacCannell, the famous tourism scholar, wrote that tourism is a means to escape everyday alienation. He meant the Marxist kind of alienation, the modern condition of feeling no ownership over our job, our earnings, our time, our daily trials and tribulations. To MacCannell, the tourist looks for authenticity abroad (the real Venice, the back streets of Barcelona, the local bar in Amsterdam, etc.) because they are unable to procure this feeling back home. But there’s a different kind of alienation – the feeling of being in a completely incomprehensible place – which is a prerequisite to experiencing authenticity. If everything you encounter in your trip can be parsed, if everything makes sense, it can’t be an authentic experience. Lost in Translation understands this: authenticity can only be expressed in terms of its impossibility. Hence the movie’s persistent focus on incommunicability, while also ending with a scene that seems optimistic in the face of it. We don’t hear what Bill says to Scarlett – but they embrace afterward, resigning to whatever point it is, amidst the throngs of the anonymous masses. That resignation is, to me, the movie’s point. And the paradox is that it communicates this precisely because it takes place in a rendition of Tokyo that is incomprehensible. This resignation is what an undirected walk through Tokyo – its streets and tunnels, its stations, malls, trains, and crossings – amounts to. It is the excess of alienation, a completion of its effects, that brings the city and its residents back around, makes it finally visible, understandable, and that allows us, at last, to partake in its modern splendor. I was having breakfast in an endless mall, some generic Frank Sinatra song in the background, seeing life slip by. The business ladies in fancy suits, the schoolboys with their headphones over their caps, the Chinese tourist families, the hipsters, the leather bags and plastic bags and laptop bags and tucked-away pens and name tags and necklaces and the syncopated rhythm of its totality. It is all about that rhythm, the clockwork of the city’s infrastructure, the gates at the metro stations swinging to some unseen conductor, the crammed bodies on the JR during peak hours. Resignation to that rhythm is the only option. Murray and Johannson say goodbye in the throng of people in Shinjuku, passing them by as they fall out of touch with each other and with us. But I feel like I’m coming home in this incessant shoulder-rubbing, this flow of others in numbers that exceed the imagination, this big at-once-ness in which one cannot but partake, where there is no room to fall into alienation – even when you are a stranger.